Only a year before Fabricated Plastics Inc. incorporated in September of 1971, many made long journeys to New York to pay respect at the passing of Vince Lombardi who died on September 3, 1970 at the age of 57. The foundation of FPI Industries is a belief expressed in the words of Vince Lombardi – “Quality is never an accident; it is always the result of high intention, sincere effort, intelligent direction and skillful execution; it represents the wise choice of many alternatives.” Machining engineered plastics is an industry that has motivated many since the introduction of plastics met the industrial revolution - a time when discussion revolved around antiquities such as cellulose and line-drives. Countless changes have taken place since then, but the will and spirit that drove early entrepreneurs has remained intact: Achieving the utmost level of preparation in all matters to satisfy the requirements of clientele. The rule: Flawless organization best develops available resources. Success in the industry is the consequence of a top-echelon team efficiently directing finance, technology, and personnel to meet immediate and difficult objectives. There is one main goal: To reach the maximum level of execution in every area surpassing expectations of an extremely demanding market. Lombardi asserted that, “Individual commitment to a group effort - that is what makes a team work, a company work, a society work, a civilization work." With dedicated individuals, that working team is FPI Industries. FPI's future has never been a journey of uncertainty. Since the early 1970's, FPI has forged ahead with a clear, yet flexible sense of direction. 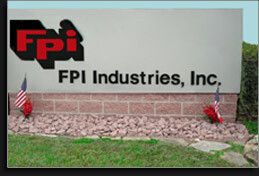 FPI Industries is a key distributor for many of the industry's major manufacturers of engineered plastics. The company's stability over the years proves to be a priceless commodity for its customers. Duty is not just to the FPI name, but to its ideals and virtues. FPI's traditional and modern values will continue to be its strength in the future. George Halas’ expression regarding Vince Lombardi describes the very nature of the work effort at FPI Industries. Halas said, "You might reduce Lombardi's coaching philosophy to a single sentence: In any game, you do the things you do best and you do them over and over and over." FPI Industries is serious about service and welcomes all requests for a quote.